Traffic Message Signs-OPTRAFFIC CO., LTD.
Optraffic's amber & color traffic message signs are made to the highest quality standards in our ISO9001 certified manufacturing facility, comply to MUTCD. You can design and create any colorful message with graphic symbols, text or graphics combined, make multiple message screens and even create simple animations in amber or color. 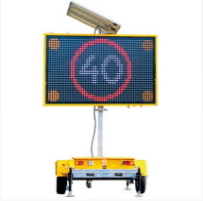 Optraffic's amber & color traffic variable message signs are manufactured with innovative technology popularly used for traffic management, council & constructional engineering, mining industry, store advertising and public notice of upcoming events like large meetings and sport events. A multiple of sizes and options are available. Hydraulic mast lifting system allows one person to easily raise and lower the board. Safety lock: Wheel, battery box and control box. OPT amber/color variable message signs trailers are all wind-loading approved, double layers trailer allows to be forklifted, and also heavy duty standard couplings allow our VMS to be towed by most vehicles, OPT variable message signs must be your best choice for using outdoors. Amber/color traffic variable message signs supplied by OPT are available both for full remote controlling and on-site programming via phone, tablet, laptop and computer, OPTRAFFIC has already developed very stable software to supply most convenient service to our esteemed customers.